In January Marla described her trip to one of the small post offices near our house. A few days ago I took a drive to visit other nearby post offices. On my drive I took photos and talked to the post men and women to learn more about them. I wanted to learn something about these towns and what the post offices meant to them: it was more than just sending packages and selling stamps. For many of these tiny dots on the map, a post office and a zip code is about identity. In Virginia, our local post office served not only our suburban town, but also the surrounding Fairfax County communities. I knew the postal clerks by sight, but not their names or their stories. The post office almost never emptied of customers, so I rarely had the opportunity for more than a few words of greeting. At the busiest times, especially before Christmas, the line might reach the door. I suspect this is the kind of post office most of us are used to. Under budgetary pressure to reduce costs, the United States Postal Service (USPS) wants to close down these tiny, mostly unprofitable post offices. But for now, they remain open. Having visited them, I understand why it is important to local residents to have their own post office rather than traveling long distances to the next big town. In the lower Perkiomen Valley most local hamlets still have a small post office. These post offices date back to the 1800s when the region consisted of market towns and farms. People didn’t have the means to travel long distances to a faraway post office. Transportation networks might consist of dirt roads and wagon trails. Today, these post offices continue to provide identity to tiny settlements. One of the downsides to these small post offices is their limited hours. They typically are staffed by one, or maybe two people. You may walk into the post office and find no one at the desk because the one person who works there is in the back sorting mail or doing paperwork. Many of these post offices close for lunch when the postman or woman goes home for lunch. On Saturdays they close at 11:30. Schwenksville is named after early settler George Schwenk, whose son served in George Washington’s army. Interestingly, George Washington and his army camped around Schwenksville in the fall of 1777. It’s population was 1385 according to the 2010 census. In Schwenksville, postmaster Fred is somewhat of a local celebrity. Everyone here knows him. A former rocker, he is deep into music and has a huge LP collection. One mile north of Schwenksville is the community of Zieglersville where Routes 29 and 73 merge – a Wawa convenience store is located at the circle intersection. Zieglersville is unincorporated, which means it is part of a township — in this case Lower Frederick Township. This is a Pennsylvania thing. For the last two decades the Zieglersville Post Office has also served the nearby community of Spring Mount. The small post office in Spring Mount no longer exists. Located behind what is today Johnny’s Pizza and Pasta Ristorante Italiano, it burnt down about twenty years ago and was never reopened. Upper Salford Township is the next township to the north and east. The road between Philadelphia and the northwestern portion of the county, today’s Old Skippack Pike, passed through the area as early as 1728. The total population for the entire township is about 3,300 (2010 census). Within the township are the hamlets of Salfordville, Salford, and Woxall; each has its own small post office. While these post offices do not deliver mail, they provide all other postal services. In the 1800s Salfordville was a bustling village with a one-room schoolhouse and even a cigar factory. Today the Salfordville Post Office is one of the only places around that retains the name and identity. Further down Salford Street from Old Skippack Pike, about a mile away, is the even smaller Salford Post Office, open only in the afternoons. Salford is best known as the site of the annual Philadelphia Folk Festival, now in its 55th year. It is the oldest continuously run outdoor music festival in North America. 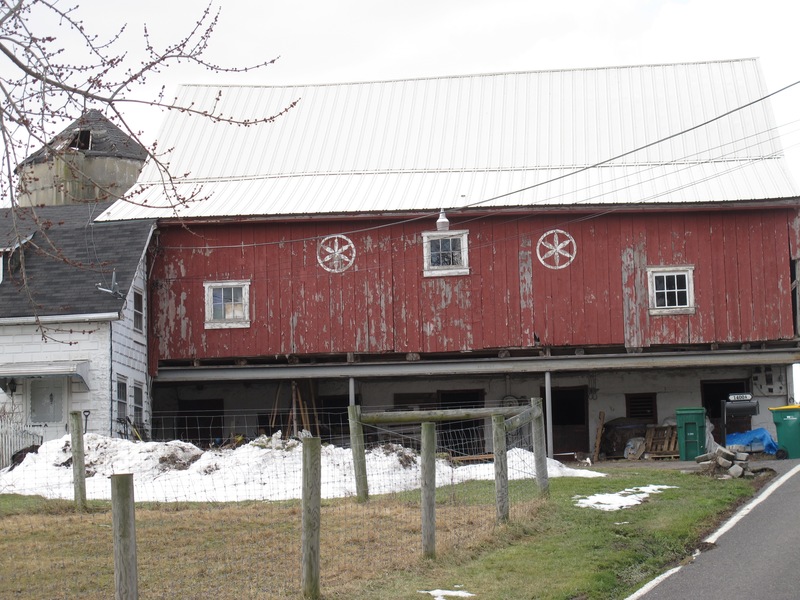 Originally known as Kroppestettel (“Crowstown” in Pennsylvania Dutch), Woxall dates from the 18th century. The Old Goshenhoppen Church is its most well known landmark. In a late 19th century name change, residents submitted the name “Knocks All” to postal authorities – taken from a box of soap in the village store. Postal authorities may have misread the “N” for a “W” and approved the new name. Wikipedia mistakenly reports that Woxall is served by the post office in nearby Harleysville and uses a Zip Code of 19438. That might be a surprise for residents where their post office uses 18979 as its Zip Code. Higher up the Perkiomen Valley is Green Lane, PA. (population 508 in 2010). Back in the 1960s, our family enjoyed Labor Day cousins gatherings at Green Lane Park, located above the village. Created when a reservoir for Philadelphia was constructed in the 1950s, Green Lane Park offers miles of trails, boating facilities, fishing, and camping and picnicking sites. It is also the upstream terminus of the Perkiomen Trail, a wonderful bike path that connects to the Schuylkill River Trail near Valley Forge. A couple of miles down Gravel Pike (otherwise known as Route 29) from Green Lane is the unincorporated community of Perkiomenville. Their website claims that Perkiomenville’s population is 5,701 when the entire population of Upper Frederick Township where Perkiomenville is located contains slightly more than 3,100. Someone needs to correct this! Longtime Postmaster Nancy is originally from Philadelphia. Like Fred in Schwenksville, she knows everyone, and everyone knows her. West of Perkiomenville in Upper Frederick Township, beyond the tiny hamlet of Obelisk, is Frederick, Pa. The only stoplight for miles is in front of the post office. There, Route 73 (Big Road) intersects with New Hanover Square Road, Renninger Road, and Hoffmansville Road. East of Perkiomen Creek down Camp Wa Wa Road is the unincorporated community of Lederach in Lower Salford Township. The Lederach Post Office was busy when I visited and had a number of cars in the parking lot. It is two miles down Harleysville Pike (Route 113) from the Harleysville Post Office, the largest in the area. Harleysville Post Office is open until noon on Saturdays. The communities in our region have histories that can still be seen in the many tiny post offices. While uneconomic for the USPS, they do serve to keep community identity from disappearing. Once the Zip Codes are gone, they won’t return.